Bristol Palin gave birth to her second child, a girl named Sailor Grace, on December 23, 2015. That’s what Sarah Palin wants you to believe, say truthers. Yes, with the birth of a new Palin baby comes the birth of a new conspiracy theory. 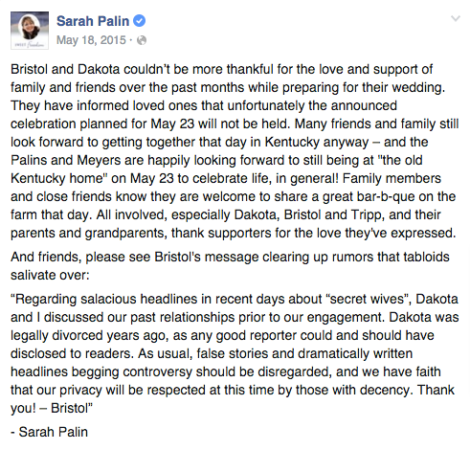 In brief: Palin truthers claim Bristol is lying about when she gave birth in order to cover up the fact that her pregnancy was the result of a one-night stand. This isn’t the first time the Palins have had to deal with wild internet skepticism surrounding a pregnancy, of course. After Bristol made her 16-and-pregnant debut alongside her VP candidate mother at the 2008 Republican National Convention, some speculated, in great detail, that the pregnancy was not her first. The claim, again in brief: Sarah’s son Trig is actually Bristol’s, and Sarah staged a huge hoax to cover it up. That theory has never been definitely proven. (Or disproven, the Internet whispers.) Does this new claim hold any more water than the last? Let’s investigate. She also posted a now-deleted photo of them kissing on Instagram. The wedding was apparently scheduled to occur two months later in Meyer’s hometown in Kentucky. But days before the May 23 ceremony, Sarah took to Facebook again to announce that the wedding was off. 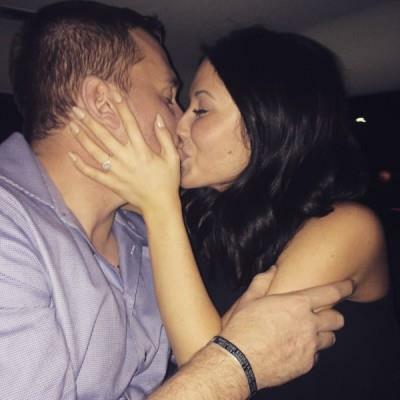 Bristol did not comment except to say that the cancellation had nothing to do with Meyer’s previous marriage. Then, on June 25, Bristol announced she was pregnant. In a post on her blog, she wrote, “I know this has been, and will be, a huge disappointment to my family, to my close friends, and to many of you.” She did not name the father. None of us are perfect. I made a mistake, but it’s not the mistake all these giddy a$$holes have loved to assume. This pregnancy was actually planned. Everyone knows I wanted more kids, to have a bigger family. Believing I was heading that way, I got ahead of myself. Things didn’t go as planned, but life keeps going. —and Sarah quickly followed up with a congratulatory Facebook post. The baby was conceived after the May marriage and arrived a bit prematurely. The real father, RWC wildly speculates, is someone Bristol met on a Valentine’s Day weekend trip to Vegas (one she thoroughly documented on Instagram). When Bristol posted another photo from Vegas weeks later with the comment “😂😂😂😂 no stings pulled this trip....... Just ruined my life the next night 😂😂😂😂😂 #worstvalemtimes#dahdahdahttt”, she must have meant that she “ruined her life” by getting pregnant. In short, RWC’s Instagram-theorizing about the “real” paternity of Bristol’s baby is weak. 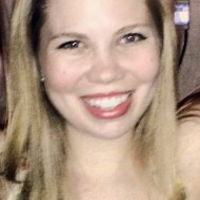 But if Bristol did accidentally become pregnant before she got engaged—in Vegas or elsewhere—there’s an understandable motive as to why she would want the public to think she conceived after the engagement, or perhaps more ideally, after the wedding that was supposed to follow soon after. Since giving birth to her son Tripp, Bristol has been a paid speaker for the Candie’s Foundation, an organization that aims to prevent unplanned pregnancies by preaching abstinence. In 2011 alone, Bristol made at least $262,000 speaking on behalf of the foundation. Had Bristol been married when she announced her pregnancy in June, she might not have had to deal with so many people calling her a hypocrite. According to the top line of the post, Sarah—or someone in charge of Sarah’s Facebook page—posted this photo from New Orleans, Louisiana, a far way from the Alaska hospital where Bristol supposedly gave birth the day before. Perhaps giving more weight to RWC’s theory than she should, Bristol actually addressed the claim that she faked her baby’s birth date yesterday afternoon. 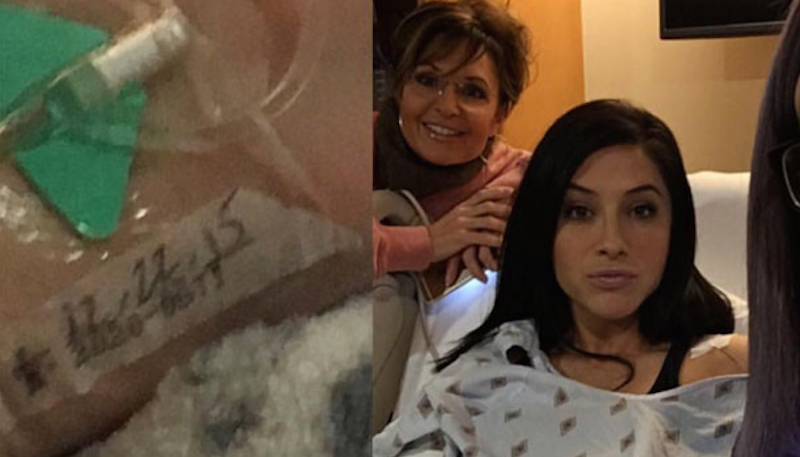 She provided a new hospital photo to Entertainment Tonight, claiming that it shows an IV date of 12/22/15. 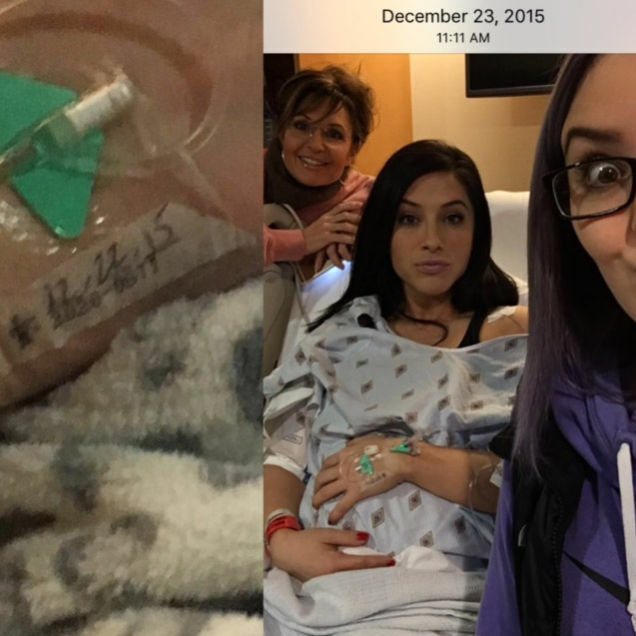 “Admitted the night of 12/22/15 when they started my IV and then day of 12/23/15 had my baby girl!” she told ET. 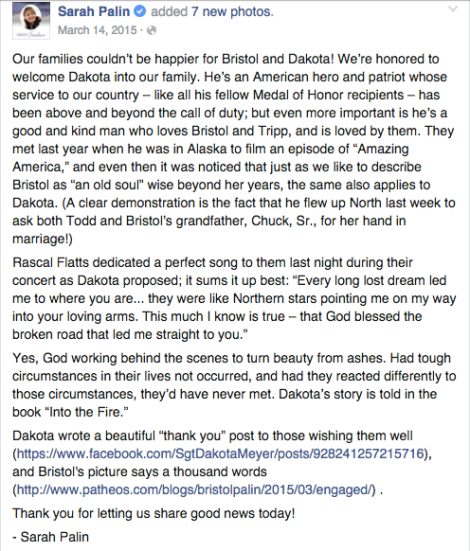 “For many months we have been trying to reach out to Dakota Myers [sic] and he has wanted nothing to do with either Bristol’s pregnancy or the baby,” Palin told ET. 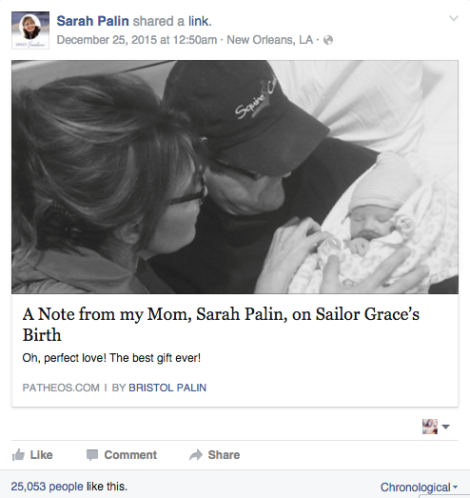 Neither Sarah, Bristol, nor her rep confirmed Sailor’s paternity. According to her Instagram, Bristol has been out shooting guns. Maybe Bristol picked the name “Sailor” well in advance, and she was strongly attached to it, for whatever reason. Or maybe she had already signed the birth certificate. Photo via ET video. Contact the author at allie@gawker.com.